"It All Starts With Bonding Here In The Northern Forest!" 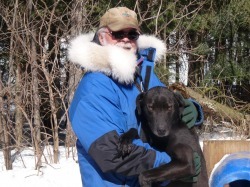 In this complex World, life with Sled Dogs is really quite simple. As humans, we try to make life more challenging. However, with dogs it is not that complex. First, we have to start to think like a dog for their thinking is very simple. They like attention, food and exercise. Let's start at the beginning "BONDING". Here, we try to start as soon as the puppies are born. The pups are taken right after they are cleaned by the mother, petted, blow my breath in their face and then placed next to the mothers breast. This way the puppy gets to start their life with a relationship with you. I learned this procedure from Susan Butcher (a four time champion of the Iditarod Sled Dog Race in Alaska). Susan had a great bonding and trust of her dogs which was one of the reasons for her success. You have to have daily positive/caring interaction with the puppies as they are growing up. They grow up enjoying your company and building their trust in you. These are some of the most enjoyable moments for me and them. When I go out to the puppy pen, I call "puppy, puppy, puppy" they come running to the to the entrance anticipating a fun interaction with me. This interaction and observation helps you to learn about their personality and where they fit in the pack. All this interaction should be positive and fun for them and you. Bonding , to me is one of the most important part of Mushing! If you are looking to add a new dog to your team, Spring is a good time to do it as you have 6 or seven months to form a relationship with your newest member to the team. If you acquired a dog through the running season, this time now will make a big difference in the dogs performance in the upcoming season. Remember to think like a dog! It is coming to a new pack, new home, new surroundings, new feed and a new kennel routine. It is your responsibility to make its life here the most comfortable in can be and assist it to fit in to its new family.